The trip will start with a flight to Redmond, Oregon. We backpack in Oregon for 5 days (click photos below to view enlargements). 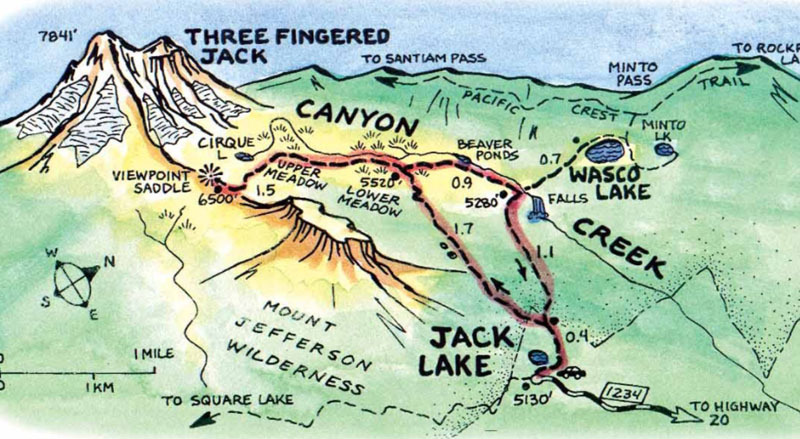 We will hike in the Mount Jefferson Wilderness in an area around Three Finger Jack. 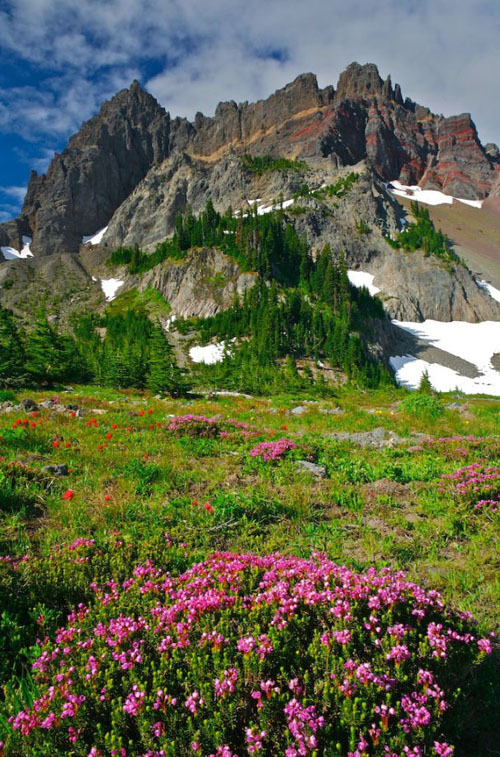 We will likely summit the butte shown in the attached sketch, Porcupine Peak and then on the last day Three Finger Jack, a notable volcanic peak. 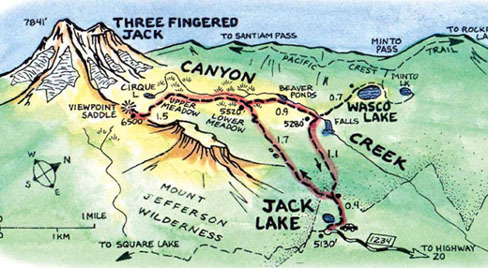 We will also hike at times along the Pacific Crest Trail (the Westcoast long through trail a bookend to the Appalachain Trail in the East). We will be out and on our own, not crossing any roads during our time in the backcountry. We will then fly mid trip to the East coast, leaving in the morning and spending that night at Cliff Island on Newfound Lake in NH. On Cliff Island we will join another COLS trip which will have been backpacking in NH. The two COLS trips will then spend 2 1/2 days on the island together playing games, swimming, with an option to rock climb at Rumney and a possible mountain bike ride in Plymouth. The trip dates will be from July 26th - August 2nd. For those traveling by airplane, the travel days will be the July 25th and August 3rd. We will pick boys up from the airport and help coordinate flights. For more information, contact Andra at afoster@COLS.org. 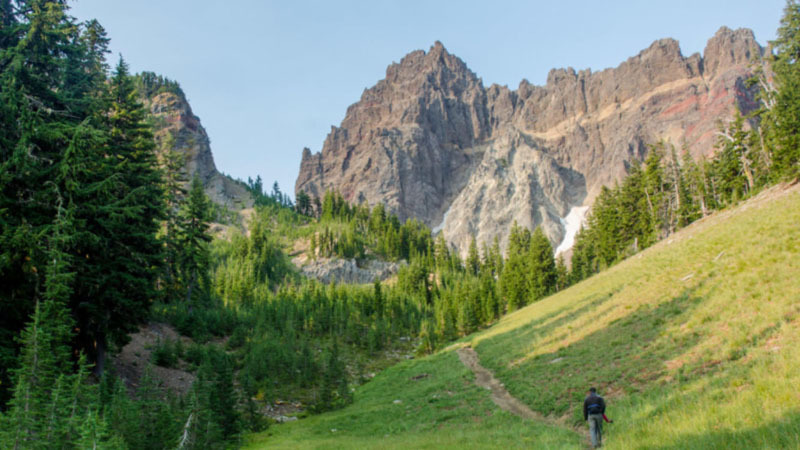 This trip will be five days of backpacking in the Bond Ranges, three days on Cliff Island located in New Found Lake, and rock climbing in Rumney. The trip dates will be from July 26th - August 3rd. For those traveling by airplane, the travel days will be the July 25th and August 4th . Our staff will pick boys up from the airport and help coordinate flights. This trip will be five days of backpacking in the Baldface/Cater Moriah ranges, three days on Cliff Island located in NewFound Lake, and rock climbing in Rumney. The trip dates will be from July 28 to August 4. For those traveling by airplane, the travel days will be the July 27 and August 5. Our staff will pick boys up from the airport and help coordinate flights. 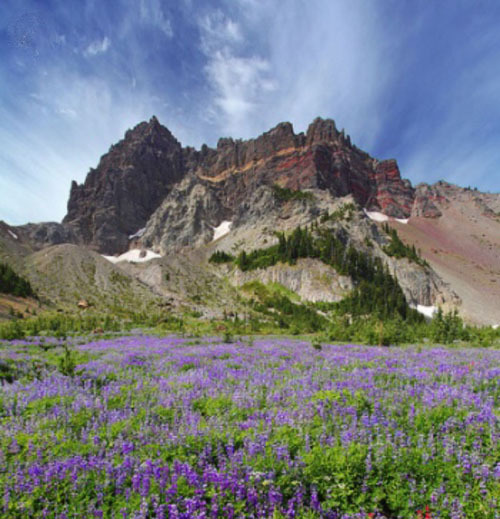 The trip to the Bend, Oregon region will encompass six days of backpacking in the Mount Jefferson Wilderness Area, three days of rock climbing in Smith Rock State Park and three days of mountain biking in Bend. This year's trip will be 12 days, starting June 25 and ending July 5. Travel days for those coming from out of state will be June 24 and July 6. 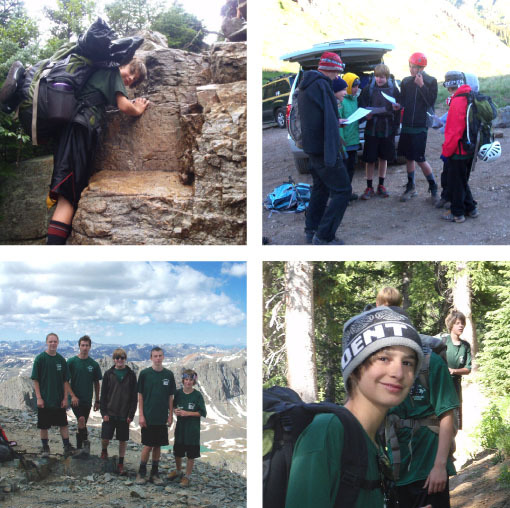 The 2016 COLS trip brought boys aged 14-17 on adventures in Oregon, including backpacking in the Cascades, mounting biking in Bend, 1000 foot rock climb up Wolf Rock, bouldering at Sisters, 100 foot rappel off French's Dome. These were amazing adventures out west. The 2016 COLS trip took place June 24 - July 6, 2016. Take a look at photos from the trip here. The 2015 New Hampshire trip was for boys ages 13-15. There were five days of backpacking, two days of white water kayaking with instruction, and four days on an island on Newfound Lake. We spent 4 days on Cliff Island on Newfound Lake, one of the cleanest lakes in the world. Cliff Island is a beautiful, 6 acres island that is completely undeveloped. The island is off the shore of a state park with a long sandy beach. In addition to swimming, games (ultimate frisbee, capture the flag ...) and all the fun things we did on the island, we had an opportunity to rock climb at Rumney, one of the top climbing areas in the Northeast. All COLS trips place an emphasis on leadership, particularly on leading yourself. They also include fun and engaging devotionals. Groups are encouraged to work to encourage one another and help each other out. This makes the trip more fun for everyone, and hopefully it influences our ongoing life habits. The intent is to contribute to the all the boys' growth in faith, character, friendships and life experience. The trip dates were from July 15-24. For those traveling by airplane, we pick boys up from the airport and helped coordinate flights. When appropriate we provide a staff member to fly with the boys. The 2014 New Hampshire trip was for boys ages 12-14. We spent five days backpacking trip and four days on an island all to ourselves. The backpacking trip was in the Baldface/Cater Moriah ranges, with hiking and camping in the Moriah Brook area, a beautiful place to swim and explore. We also spent a night at the Imp shelter, which offers one of the best places to watch a sunset in the White Mountains. We spent 4 days on Cliff Island on Newfound Lake, off the shore of a state park with a long sandy beach, and we went rock climbing at Rumney. Our Summer 2013 COLS trip took place June 26 - July 5, destination Fayetteville, West Virginia. Fayetteville is a destination adventure spot, and a COLS favorite on previous trips. From an outdoor adventure aspect it was more technically oriented with white water kayaking, rock climbing, and mountain biking as well as having fun on Summersville Lake. We also stopped at Gettysburg, Pennsylvania on the way home (July 4th evening and the next morning). As with all COLS trips, the goal was to encourage each participants in their faith and life skills, all in the context of having a good time. The 2012 trip was a 10 day trip from (July 11th to July 20th) in Colorado. The trip included 6-7 days of backpacking. The group visited the continental divide and also on the top of Longs Peak (14,260'), the highest peak in Rocky Mountain National Park. The weather cooperated, and we were able to rock climb near Estes Park Colorado. There were plenty of opportunities to fish, swim (very refreshing - cold :0 ), and play games.